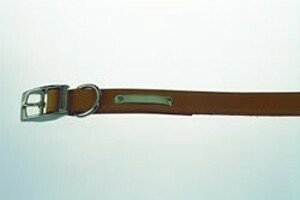 Handsewn Leather Dog Collar Tan 12"
High quality Handsewn, durable Leather Dog Collar. Details: Note Dog Collar length includes buckle. Handsewn Leather Dog Collar Tan 14"
Handsewn Leather Dog Collar Tan 16"
Handsewn Leather Dog Collar Tan 20"